So you’ve got engaged and started planning your wedding. It’s exciting, isn’t it? However, it can become quite stressful when you think about all the decisions you need to make. Once you start the planning process, you’ll likely have a never-ending to-do list along with budget constraints. Don’t let that get you down. The key is to stay organized, stick to your vision, and choose the right vendors to help bring your dream wedding to fruition. When I was planning my wedding, I quickly realized that wedding vendors can either make or break the experience. You can’t do everything by yourself, so it’s important to have quality vendors on your side who can take some of the burden off your shoulders and deliver stunning results. I recommend interviewing vendors and reading their reviews online or checking references before settling on one company. Here are a few key red flags you’ll want to look out for when considering wedding vendors. When choosing a venue, the number of guests attending your wedding will greatly affect the price. While you’ll likely have to estimate how many guests you’ll have, there’s no way of knowing who will actually show up and the venue should understand that. Venues that base their pricing and contract on your paying for a minimum number of guests should be avoided. For example, if you invite 150 people to your wedding and only 120 show up, you could be stuck paying for the 30 empty seats along with 30 meals. Ouch. While it’s important to make sure the venue can accommodate the number of guests you’ll have, you also want to keep it flexible. Give the venue a ballpark number of attendees and only agree to pay for the guests that actually show up. If you’re going to offer food or appetizer’s at your wedding reception, be sure to schedule a tasting prior to the event. Wedding food can be so costly, and it makes sense to sample some of the meals before you agree to order food and supplies for 100 portions. Yet and still, some caterers and vendors won’t offer you this option or even consider it. This is an issue my husband and I faced when planning our wedding. We chose an all-inclusive venue and selected our meal choices. The owner of the venue claimed we couldn’t do a tasting because he’d have to pay cooks to come in and prepare the food and it would just be a hassle. Being able to taste the food ahead of time was important to us so we still persisted. Let’s be honest, I didn’t want to waste all that money on some nasty food. To avoid this, make sure you clarify whether a food tasting is available with the vendor at the very beginning of the process. Find out other event tips from Sho.sg Event Management agency experts. Generally, most bakeries won’t charge to deliver your cake or desserts for your wedding because the price will already be factored in. This can be a big convenience and one less thing you’ll have to worry about on your big day especially if you’re on a budget. If a bakery does charge a delivery fee for your cake, I wouldn’t say run for the hills but just know that there are probably plenty of other shops in the area that won’t charge you at all. Communication is everything during the wedding-planning process. 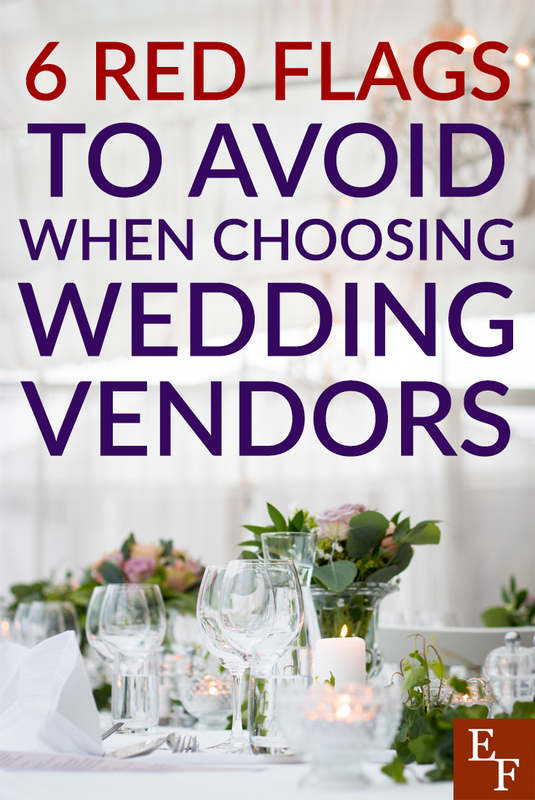 If your wedding vendor is hard to get a hold of or doesn’t respond, you may need to consider walking away. If you have an appointment to discuss something with a vendor and they show up late or fail to communicate properly, that can be a huge red flag. How can you trust them on your big day when they fail to be responsive during smaller commitments? It’s not wrong to respect a callback or email response within 24-hours or less especially when you’re on a deadline and spending a ton of money. A vendor who communicates well and responds promptly will have an easier time gaining your trust and confidence, and help you with choosing private armed security (Security Guard Companies) for your important event. Contracts with your venue should be detailed and comprehensive but you shouldn’t feel like you need to consult with a lawyer in order to understand it. Your point of contact should actually talk you through the details and summarize what the contract entails. If they don’t do this by default, be sure to ask. Look out for hidden fees, add-ons, complex language, and outrageous cancellation policies. Yes, strict cancellation policies can be detrimental. If by chance you needed to cancel your reservation or reschedule the wedding date, you want to be able to do so in a timely manner and still receive some of your money back. A non-refundable deposit is okay especially with a venue because they need compensation for blocking out the date. However, if you need to cancel for any reason, you shouldn’t have to pay the full price for the contract if you do so within a reasonable amount of time (60 days prior). If you don’t see a topic highlighted in the contract, be sure to ask about it just to be safe. Negative reviews should always be a red flag when examining a vendor for your wedding. While all bad reviews won’t hold the same weight, you’ll want to watch out for the detailed ones. If the person leaving the review is making solid and specific points about why they disliked the vendor’s service as opposed to just complaining and being vague, you need to listen up. Take the date of the review into account along with other factors like the time of year, person in management, common pattern with other reviewers, etc. If you’re still thinking about using the vendor, be sure to ask them about the bad review if they didn’t respond publically. Perhaps the person who gave the client such a bad experience is no longer with the company. Either way, you don’t want to gloss over such important details. Choosing the right wedding vendor is crucial when planning your big day. You want everything to run smoothly and with careful planning and the right team, you can make it happen. Have you ever experienced any of these red flags when considering wedding vendors? What would you recommend people watch out for? Related: Why you should choose team bonding activities in Singapore?